Our free Business Plan Template provides business owners and entrepreneurs with a step-by-step approach to writing a solid business plan. You've probably heard the old saying, "Failing to plan is planning to fail." Well, it's true so take a few moments to discover how simple the business planning process can be using this valuable tool. Unfortunately, too often aspiring entrepreneurs plunge head first into a new venture without taking the time to plan. This is one major reason why so many start-up business fail. Most business owners fail to write a business plan because they tell themselves the process is too difficult or too time consuming. The truth, however, is they don't complete a business plan because they don't know how and they are fearful about the process. Writing a business plan does take time and if done correctly it will force you to learn more about your business. That's a good thing! As the business owner, your chances of being successful improve greatly the more you know about all aspects of the business. For instance, a business plan requires a full review of the organizational structure, operations and facilities, suppliers, marketing strategy, competitive analysis, financial management and more. However, the time it takes to complete a business plan is well worth the effort because when you've completed your plan you will have a much clearer vision for the future of your business. Business plans are only for bankers or investors - Not true. While a detailed plan is typically required by outside lenders, the primary benefactor of a business plan is you, the business owner. Armed with solid plan, you will have the skills, insight and confidence you need as a business leader to successfully manage the growth of your business. Business planning is a one-time event - Hopefully not. Wise business owners will take as much time as they need initially to write a comprehensive business plan. However, the plan should be reviewed and updated on an ongoing basis. The business environment is constantly changing so the assumptions made in your initial plan will need to evolve over time. Highly successful business owners not only track the progress of their plan, but they update the business plan annually at a minimum. I don't need a business plan for my small business - Yikes, also not true! Considering the fact that the vast majority of new small businesses fail within the first 3 years should be a major red flag to new business owners that all businesses need a solid business plan. Small business owners will benefit greatly by investing the time and effort to educate themselves on how to effectively run and operate a new business. In doing so you'll greatly increase your chances of success long-term. Now that we've debunked some common myths, let's dive into the many benefits of using our business planning template. Sometimes if okay to be "professionally selfish", meaning doing something because it's good primarily for you. Why? Because if something is good for you as a business owner, then it's likely that it will also benefit those who count on your business being successful. For example, your employees, your lender and your customers. Creating and managing to a well prepared business plan will benefit you and those who rely on your business in several ways. Gain Objectivity - Business owners are typically very passionate about their business. So passionate in fact that sometimes that passion can get in the way of making tough decisions that might require you to slow down the rate of growth. Too often new businesses attempt to expand too quickly, which can lead to failure. Completing a comprehensive business plan helps business owners take a 30,000 foot view of the business, which forces you to make more thoughtful, well-planned decisions. Greater Confidence - Running a business, large or small, is hard work and it can be highly stressful. The best way to lessen stress is to be well prepared. Preparedness is truly the cure for stress and anxiety in the business world. 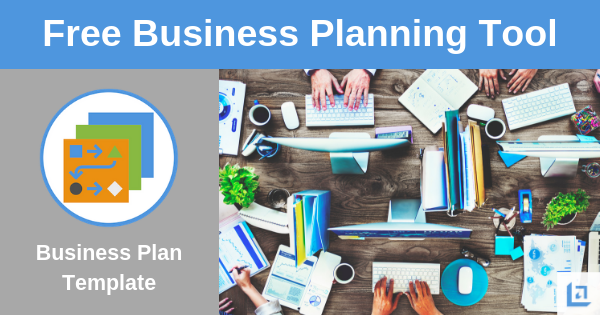 Our business planning template will start you on an important journey that allows you to better prepare yourself and your business for success. The knowledge gained during the business planning process will proportionately improve your level of confidence as a business owner. Increased Accountability - Business owners are ultimately accountable for the success or failure of the business. However, the burden should be shared by every employee in the business, from senior/mid/entry level managers to front-line employees. Your business plan helps to define the roles and responsibilities of every employee. Once these roles are clearly defined and goals are assigned, the business owner can hold everyone more accountable for their performance and results. Improve Cash Management - One of the biggest risks to a business is running out of available cash. One of the most valuable benefits of a business plan is learning how to read financial statements, and particularly the skill of managing cash-flow. The old adage is true, "Cash is King!" When you have a lot of cash, your options are boundless, but when cash is limited so is your ability to be nimble and take advantage of opportunities as they arise. Managing your cash-flow is not difficult and it's a must-do for every responsible business owner. Reduce Taking A Wrong Turn - When you are armed with a solid business plan you see your business from a holistic viewpoint. In other words, you don't just see the business through a marketing lens, or a financial management lens, or an operational or organizational lens - you see the business in its entirety. So, when an opportunity comes along, you'll decide whether or not to move forward only after considering how it will affect all aspects of the business, not just one or two. Taking this holistic approach when making important business decisions will help you to make better, more thoughtful decisions - and decrease your chances of making any wrong turns. The preceding list is only a small fraction of the many benefits you'll experience should you choose to complete a comprehensive business plan. Like anything that is important, the process can take some time, but the journey is highly rewarding. 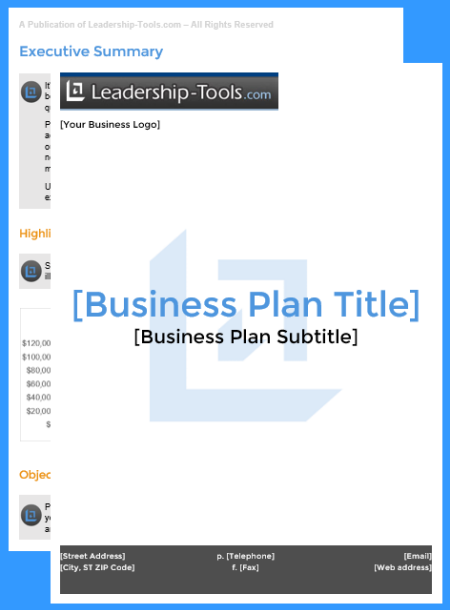 Start today by downloading our free business plan template below. Best of luck to you in your business planning journey. To download our free Business Plan Template, simply subscribe to our free newsletter. You will immediately receive a password that grants access to our entire leadership tools library.